This tour takes you to northern Arizona where your group will get to see the some of the famous slot canyons that Arizona is known for. These amazing canyons are located on the Navajo Reservation and the views that they offer are simply stunning. Enter a wondrous world of swirling sand, amazing light, and fantastic contrasts. This is Antelope Canyon. Carved by wind and water, this slot canyon is located very near Page, Arizona, the home of Lake Powell. Tours departing Sedona will wind through beautiful Oak Creek Canyon. You’ll fill your water bottles with pure natural spring water; water that has been underground for hundreds of years. We will climb to the top of the Colorado Plateau, a land-form unique unto itself, and travel through the San Francisco Volcanic Field. This volcanic field is home to over 600 dormant volcanoes. Passing onto the Navajo Reservation, we will make a short detour to view dinosaur tracks created tens of millions of years ago. Then it’s a drive up a strike valley all the way to Page. You will be able to choose between Upper or Lower Antelope Canyon for the tour. 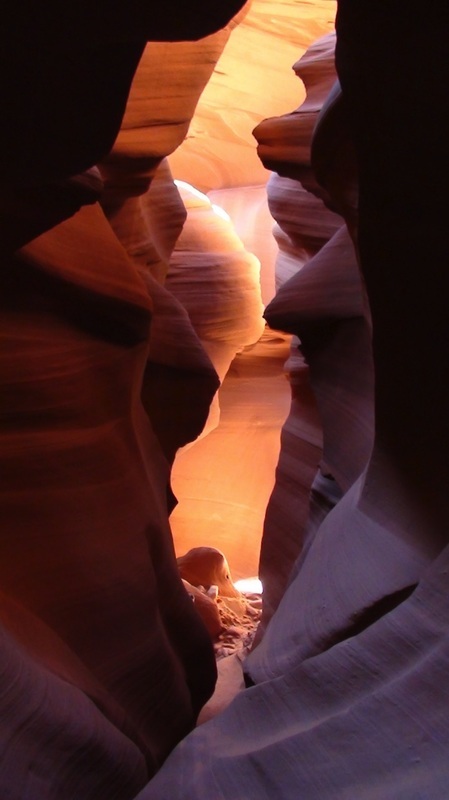 Both offer an unparalleled experience in a narrow slot canyon filled with exquisite erosional features and lighting effects. It is to be noted that lighting changes with the seasons and time of day. On the return to Sedona, we have time for a short hike to Horse Shoe Bend Overlook, or a short drive to Navajo Bridge, spanning the very beginning of the Grand Canyon. After exploring Antelope Canyon by ground, we will next head to Glen Canyon Dam, where we will take a scenic and informative tour of the dam. On this tour you will get to see amazing angels of the Colorado River as it flows through the dam feeding into the Grand Canyon. Next, we shall head south towards the Vermillion Cliffs to enjoy the multitude of layered sandstone. The 3,000-foot escarpment of the Vermilion Cliffs reveals seven major geologic formations in layer-cake fashion. This remote, unspoiled 294,000-acre national monument is a geologic treasure of towering cliffs, deep canyons, and spectacular sandstone formations, containing the Paria Plateau, Vermilion Cliffs, Coyote Buttes and Paria Canyon. Elevations range from 3,100 to 6,500 feet. It’s just another amazing spot not to be missed in northern Arizona. The duration of this tour is 10 to 14 hours. It includes breakfast, lunch and dinner, snack, and beverages throughout the day.